To Cite: Jalali S M, Mashuri N, Tamannaie Z, Jesmi F, Pazouki A. Peritoneal Tuberculosis: An Uncommon Disease Calling for Close Scrutiny, Arch Clin Infect Dis. 2013 ; 8(4):e16672. doi: 10.5812/archcid.16672. Introduction: Tuberculosis (TB) is a disease with diverse clinical manifestations. It typically attacks the lungs (pulmonary); however, it may also affect other parts of the body (extrapulmonary) with or most commonly without lung involvement. Notable extrapulmonary infection sites include pleura, central nervous system, lymphatic system, genitourinary system, bones and joints, and abdomen. Abdominal TB is one of the most prevalent forms of extrapulmonary presentations of this variable disease. Given the patients with abdominal complaints especially in developing countries, where the disease is endemic, it should be kept in mind that abdominal TB has numerous differential diagnoses. Case Presentation: Our case is a 46 year-old female with left upper abdominal pain and mass sensation, with no associated signs or symptoms, but negative family history of TB and carcinoma. The patient underwent several diagnostic procedures so that the ultimate cause for her abdominal pain would be discovered among various existing differential diagnoses. Discussion: Peritoneal TB, although not very common, is still the important cause of not only abdominal symptoms but also female infertility. The need to pay more accurate attention to peritoneal TB in endemic areas, especially in young patients considered to have peritoneal carcinomatosis, seems very important. Patients with abdominal pain and masses are frequently visited at healthcare centers on daily basis. There can be many causes for the pain or masses, ranging from benign lesions or infection to malignancies. Sometimes, it is not easy to differentiate between them by means of conventional imaging techniques such as ultrasonography, computed tomography (CT) and magnetic resonance imaging (MRI) (1-3). Tuberculosis (TB), on the other hand, is a disease with diverse clinical presentations (4). It can target almost any part of the body. Although tuberculosis typically attacks the lungs (pulmonary), it may affect other parts of the body (extrapulmonary) with or most commonly without pulmonary involvement. Notable extrapulmonary infection sites include pleura, central nervous system, lymphatic system, genitourinary system, bones and joints, and abdomen. Abdominal TB is one of the most prevalent forms of extrapulmonary manifestations of this variable disease. TB can target abdomen both as a primary and a secondary disease; the former affects abdomen from the reactivation of quiescent center, acquired somewhere in past and the latter occurs when infection extends into abdomen through ingestion of unpasteurized milk swallowed sputum, hematogenous or an infected neighboring organ (5). Abdominal TB may involve gastrointestinal tract, peritoneum, mesenteric lymph nodes, liver, spleen and genitourinary tract. As presentations of abdominal TB are multi-site, the definitive diagnosis requires a high index of suspicion, various laboratory findings, imaging modalities and histologic exclusion of malignancy (6, 7). Apart from vague signs and symptoms, peritoneal TB can have similar presentations and paraclinical characteristics with malignant peritoneal involvements namely metastatic ovarian cancer (8). Therefore, peritoneal TB can be the case for the patients with abdominal complaints especially in the developing countries. Herein, we present a case report of a 46 year-old female with non-specific abdominal pain who was finally diagnosed with peritoneal tuberculosis; considering that the abdominal CT angiography was normal. A 46-year-old female was admitted to internal ward of Rasoule-e-Akram Hospital, Iran, due to vague left upper abdominal pain, masses and sensation. She had no accompanying signs and symptoms such as nausea, vomiting, change in bowel habits, weight loss, night sweats and fever. Notably, her past medical and family history was also unremarkable. Having performed abdominopelvic ultrasonography, splenomegaly, some calcified granulomas within splenic parenchyma and a 53 × 36 × 45 mm hypoechoic solid mass with ill-defined borders in the pancreatic body was noticed. The laboratory data was as follows: white blood cells (WBC) = 7800, Hb = 13.7, Plt = 94000, fasting blood sugar (FBS) = 120, urea = 30, Cr = 0.8, ALT = 14, aspartate aminotransferase (AST) = 7, alkaline phosphatase (ALP) = 123, total bil = 0.6, direct bil = 0.4, amylase = 169, lipase = 32. 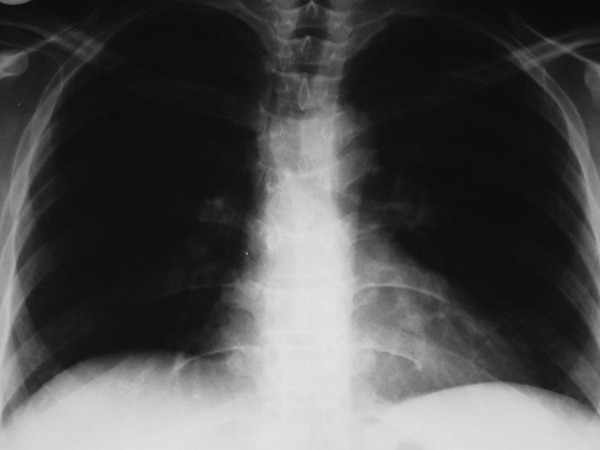 There were no pathologic findings in her chest X-ray (Figure 1). 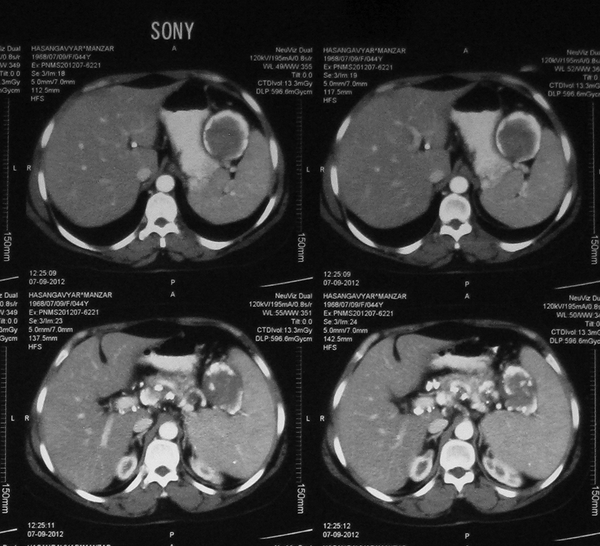 Abdominopelvic CT scan showed moderate splenomegaly, multiple calcified lesions in peritoneal space and ovaries potential of metastatic lesions (especially mucinous carcinoma) or TB (least probable case), parasitic infections (e.g. hydatic cyst) and a 60 × 45 mm hypodense lesion adjunct to splenic hilum, compatible with thrombosed splenic artery aneurysm or abscess (Figures 2 and 3). Given the additional laboratory tests and imaging, the results were as follows: hydatid Ab (IgG) = negative, CA-125 = 17.7, Wright = negative, Coombs wright = negative, 2ME = negative, carcinoembryonic antigen (CEA) = 1.2, CA19-9 = 7.5. In consequence, abdominal CT angiography was normal and no splenic artery aneurysm was reported. 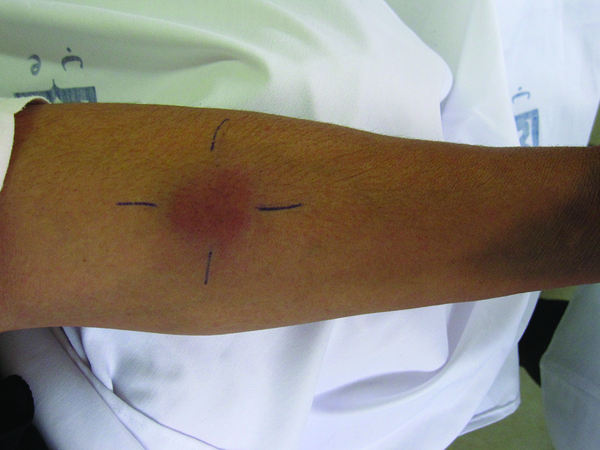 Purified protein derivative (PPD) skin test was also taken and the result was positive (30 mm after 72 hours) (Figure 4). As the diagnosis was still not clear, the patient underwent exploratory laparoscopy. The operation revealed that multiple adhesions and white to yellowish small nodular lesions were spread all over the surface of peritoneum as well as both ovaries. When pelvic exploration was performed, it was found that a small abscess-like lesion existed in left ovary. The peritoneal lesions and ovarian cyst wall was biopsied and sent for frozen section. Based on pathologic report, fibro fatty tissue with calcified nodule in the peritoneal lesion and necrotic material in the ovarian lesion was reported to have no evidence of malignancy. While studying the biopsy results of the ovarian mass, some caseouse discharge was noted which was sent for culture. The PCR was also examined for detection of Mycobacterium tuberculosis (M. Tuberculosis) DNA. It is worth mentioning that the patient had an uneventful postoperative period. All in all, M. Tuberculosis DNA was detected in the discharge from left ovary. Hence, the diagnosis of peritoneal TB was determined and the patient was referred to an infectious disease clinic for taking anti-TB treatment. Tuberculosis is the major health problem worldwide especially in developing countries, where the disease is endemic; therefore, learning about the definite diagnosis as well as the treatment are vital to uproot the disease (9). Abdominal tuberculosis involves omentum, intestinal tract, liver, spleen and genitourinary tract, which occurs in 1% - 4% of patients with pulmonary tuberculosis (10). Although abdominal tuberculosis most commonly exists in developing countries with growing incidence of immunosuppression caused by diseases like HIV orchemotherapy, the prevalence is increasing in modern countries as well (11, 12). The disease has no characteristic signs, symptoms and paraclinic findings. However, abdominal pain, fever, night sweats, ascites, abdominal distention, female infertility and pelvic mass (shown in ultrasonography and CT scan) may be present in some patients. Moreover, PPD skin test may be positive (12), also ascites fluid might also be positive for adenosine deaminase (13). Given the case under study, except for positive PPD there were no specific signs and/or symptoms. In addition, the imaging findings were completely equivocal. Serum CA-125 level (which is a tumor marker in epithelial ovarian cancer) may elevate in some patients with peritoneal TB which makes the diagnosis even more difficult. It appears that peritoneal TB can be misdiagnosed with other peritoneal diseases especially malignant peritoneal involvement and peritoneal carcinomatosis. In spite of the introduction of new diagnostic modalities such as positron emission tomography (PET), there has been little success in overcoming this problem. In this study, despite different laboratory tests and imaging modalities, no definite diagnosis was proposed. In the end, they were the laparoscopy and pathologic tissue examination which could play a role in confirming the diagnosis. Similar studies have shown that diagnostic laparoscopy combined with peritoneal biopsy with frozen section seem to be a reliable method in terms of providing a definitive diagnosis for this curable infection. Peritoneal TB, although not very common, is still the commonplace cause of abdominal symptoms and female infertility which should be taken into careful scrutiny in endemic areas, especially in young patients suspected to have peritoneal carcinomatosis. We would like to thank the Minimally Invasive Surgery Research Center for all the help and support provided. Implication for health policy/practice/research/medical education: Tuberculosis is a disease with diverse clinical presentations. It typically attacks the lungs, but it may involve other parts of the body (extrapulmonary) with or most commonly without lung involvement. Authors’ Contributions: Sayed Mehdi Jalali, Negar Mashuri and Zeinab Tamannaie wrote the manuscript. Fatemeh Jesmi critically reviewed the paper and Abdolreza Pazouki supervised the case and reviewed the manuscript. Financial Disclosure: There were no conflicts of interests. Funding/Support: This research was supported by Iran University of Medical Sciences, Tehran, Iran.